Vauxhall town council is continuing discussions around funding for their multiple recreation facilities located within town limits. With council having similar discussions throughout 2018, administration was looking to see if they were in favour of moving forward with Intermunicipal Collaboration Framework talks, which would include recreation. “We’ve talked about recreation in the past and were wondering about if we should be discussing with M.D. council about the remuneration we receive. If council is wanting to go further in depth with that, this (ICF) is the document,” explained Mayor Margaret Plumtree at the council’s regular meeting on Dec. 17. One of the biggest talking points from council surrounded Municipal District of Taber funds for town recreation and whether or not Vauxhall council felt they should be receiving a higher rate for usage of their facilities. With the M.D. putting forward a sum of money every year for town recreation building operations, Plumtree explained the funds received was spread around to all of their facilities. “We currently receive a grant of $120,900 from the M.D. and that money, we disperse to our recreation facilities,” she said. As a preemptive to ICF discussions with the M.D., the mayor and administration had started to look at budgets and ice arena usage in the town of Vauxhall. In 2017, the total recreation budget, including the M.D. contribution, was at $223,620. 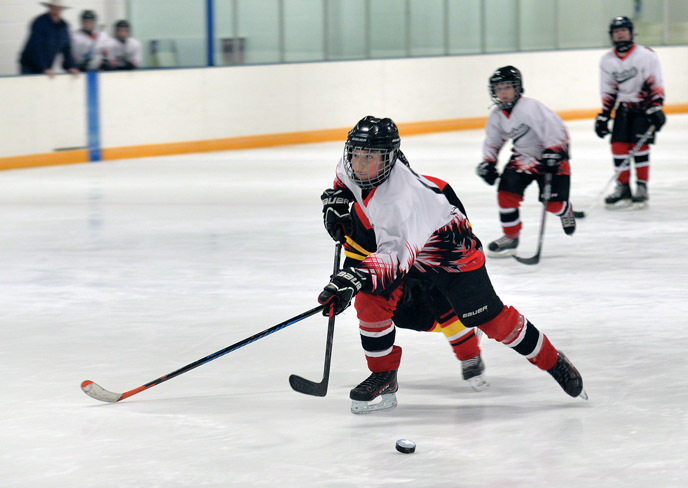 Upon looking at registration numbers from Vauxhall Minor Hockey and Vauxhall Figure Skating, they saw most of the usage was from out of town, M.D. of Taber residents. “In preparation, we did start looking at who uses the arena at the moment. We are around 70 to 90 per cent is M.D. residents,” she said. Coun. Ray Coad believes the M.D. should raise their funds to Vauxhall recreation facilities due to the higher usage rates by M.D. residents. While far from the only recreation facility in town, so far the Vauxhall arena was the only building they had looked into in terms of usage. Other facilities in town present bigger challenges in regard to getting solid numbers of where patrons are from. “So far we have only looked at the arena, we did not dig into curling or the pool. I think the pool would be very difficult to get those numbers because we would have to ask every kid where they lived,” added Plumtree. Coun. Jake Wiebe alluded to the fact it would be best to approach the M.D. with their concerns and hope they see where they are coming from. While they may not get a substantial boost, they feel the discussion sooner rather than later would be beneficial. “It would be important to have that discussion with them anyway because maybe they won’t change their numbers but maybe we could get 60 per cent. That is better than nothing,” he said. A motion to direct administration to commence ICF negotiations was made and passed unanimously by council.